Imagine, if you will, that no one you know can ever truly know what potential you have or the reality of you. Imagine, if you will, that not even you know what potential you have or the reality of you. Could you ever take the opinion of someone seriously if that were the case? Could you even take your own self doubt or self criticism seriously if that were the case? Imagine, if you will, that everything that has ever happened to you or didn’t happen to you had a purpose for the grand unfolding of your greatest experience and life. Imagine, if you will, that everything you did or didn’t do, whether good or so called bad also had purpose for the grand unfolding of your greatest experience and life. Could you ever feel like a victim or indulge in self pity? Could you ever be unhappy with your life thus far? Imagine, if you will, that how you see the world and circumstances is clouded by a filter or screen and only you see it that way. Imagine, if you will, that everyone else is also seeing the world and circumstances in their own unique way based on their own unique filter or screen. Wouldn’t you spend more time trying to discover the filter or screen and getting rid of it so you could see more and understand more instead of defending your vision? Wouldn’t you have more compassion for others in their own distorted vision or look for glimpses they might have to offer of a more clear vision? The life we would take on would be exciting and full of discovery and treasure seeking. We would not fall for the illusion of security in the status quo. We would celebrate the differences and find the profound gifts within ourselves and others. We would also celebrate the status quo without judging that either. Imagine, if you will, that every person you encounter has part of your mystery, part of the mystery of your life and purpose. How would you experience each person if you knew they were a gift of profound magnitude? Would you listen more intently? Would you see them through eyes that saw their incredible worth? Would you feel deep appreciation for their existence? Imagine, if you will, that the divine aspect of you is constantly sending you communication in whatever ways are available, constantly without stopping. Would you pay attention to your world in a new way? Would you quiet the chatter of your thoughts to give it a chance to be crystal clear? Imagine, if you will, that no matter what you do or don’t do or what someone else has done or not done that every being that has ever existed, is now or will ever be is exactly equal in worth. Would you doubt how extraordinary you are or judge another as less? Would your self esteem be attached to anything other than the fact that you exist? Imagine, if you will, that your words and thoughts create. Would you master your thoughts or at least start to observe them for insight? Would you use your words powerfully to move your life in directions that are more in alignment with what you want to live? There is no need to believe that these concepts are true, but in the imagining that they might be and seeing the world from that perspective, you can find a powerful place to be. In the playing with that perspective moment to moment you may find that your life will give you experiences that will rock your world. 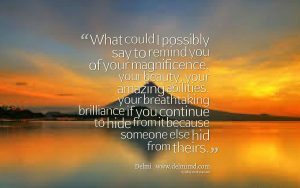 What if you were really that powerful and amazing and magnificent…just imagine.